The World Championship Series (WCS) concluded with a bang at BlizzCon 2017, and now we have a new season of professional StarCraft II® to look forward to. Read on for fresh information on the 2018 campaign that will serve as the proving ground for all would-be challengers to Rogue’s WCS Global Championship crown. The 2018 season features the same number of WCS Circuit events as last year but includes a new, supercharged kickoff at WCS Leipzig in January. At this event, and the three additional Circuit tournaments taking place at DreamHack events throughout the year, the champion will receive a direct seed into the Global Finals at the end of the year. The regional representation for each of these events will remain the same as well, with four players qualifying from Europe, four from North America, two from Latin America, two from Australia/New Zealand, two from China, and two from the Asia Pacific region. With the new stop in Leipzig, Germany for the WCS Circuit and an absolutely packed early schedule in 2018, StarCraft II pros and fans alike will have to hit the ground running. 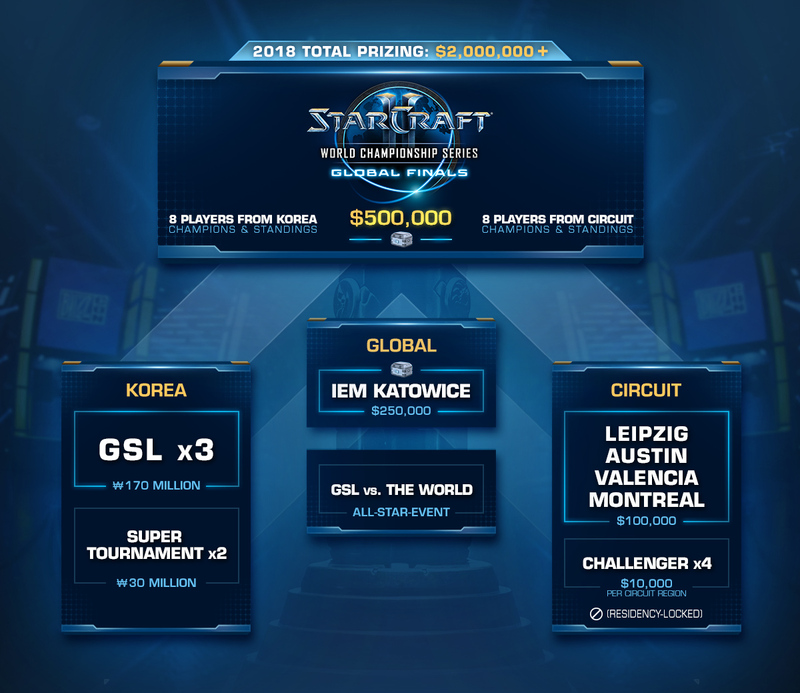 In Korea, the Global StarCraft II League (GSL) continues for its eighth year as the most celebrated StarCraft II competition in the world. 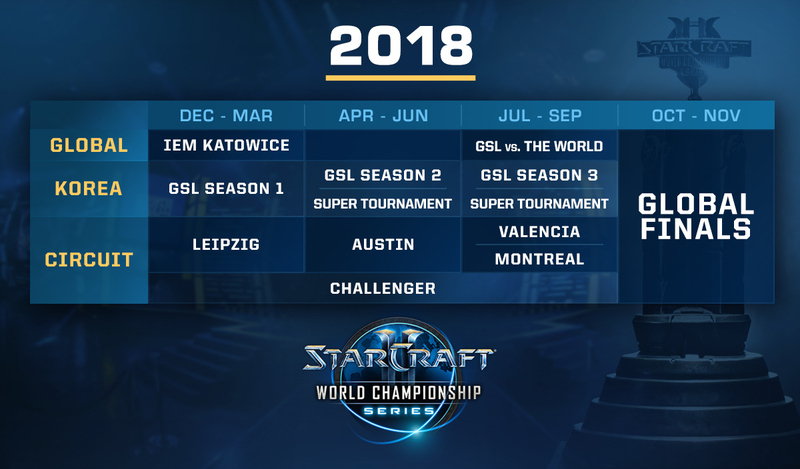 The 2018 schedule will once again consist of three GSL seasons with two GSL Super Tournaments mixed in. Each GSL season will reward the champion with a direct seed into the Global Finals at the end of the year. The thrill of seeing the top players in the world battle each other means, once again, there will be three global events in 2018. The Intel® Extreme Masters (IEM) Katowice tournament rewards its champion with a berth at the WCS Global Finals, and, for the first time, features a prize pool enhanced by the new StarCraft II War Chest, which is available now. Look for a second War Chest later in the year that will boost the prize pool of the 2018 WCS Global Finals. In addition to IEM Katowice and the WCS Global Finals bookending the global event schedule, GSL vs. the World will return in mid-2018 for a thrilling clash between regions. Watch for further details on the format and prizing for this fan-favorite event. Beyond the formal WCS competitions, StarCraft II continues to enjoy an incredible retinue of events this time of year with the World Electronic Sports Games (WESG), SHOUTcraft Kings, and the upcoming IEM PyeongChang leading into the 2018 Winter Games. In addition, with so many organizers continuing to run their own community-driven events showcasing top-tier StarCraft II competition, fans will be treated to the full spectrum of StarCraft II competition in the coming year. We have an exciting year of professional StarCraft II ahead of us, and we’ll have even more details to share in the coming months, including updates to the Challenger system for players in North America and Europe. Stay tuned to the WCS website to keep up to date on all the specifics as we head into 2018.